There are certain toys that can be used to scare others. Here are some of them. This is an action toy in the shape of a box made from tinplate. The Jack is the main figure in this toy, and the Jack is hidden inside the box once the lid of the box is closed from above. The beautiful picture, of the joker like figure, printed on the side of the box is exactly the Jack figure seated inside the box when lid is in closed status. Now, there is a handle connected from one side of the box and this handle is the main part doing all the tricks. This handle is not in anyway battery operated, but it works through a spring which is hidden somewhere and connected in some way to the Jack figure inside the box. Now, the question is, how some child or anyone else can be scared through this toy. If you want to scare a child, or anyone else, just bring him near to the Jack box and ask him to sit in a relaxed position. 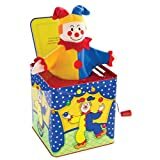 Than in front of him start rotating the handle in a clockwise direction, and do it for sometime till the Jack from inside the box suddenly pop up. A sudden pop up of the Jack figure is the main trick which is going to scare the child, or anyone else. In the picture above, the Jack is already popped up, otherwise its closed inside the box. Some children even already know that Jack is going to pop up, while the handle is being rotated, still they are scared as the velocity of the appearance of the figure is quite sudden and unpredictable. Just watch this youtube video where the toy is in action and children are getting scared. Please note: The toy in the video may not be exactly the toy mentioned here but the functioning is similar. This is another toy to frighten people through a remote controlled spider. Just watch this video on remote control spider prank, and you will get the general idea how people are getting scared, by a fake spider, controlled by the owner. Real spiders are generally found on the walls but toy spiders can also be run on the ground using a remote control, and also some toy spiders can crawl on a vertical wall, without falling, as they are electronically built in such a way. There is a spider toy I saw which first need to be turned into wall setting mode, using an electronic switch on the toy. Once the wall setting mode is turned on, the toy will start making noises (as battery is on now) and the spider will stick to the wall and will not fall. Than, by using the remote control, it can be moved on the wall. This demonstrated well in this youtube video by a family. That was another spider toy known by the name "Fantasma Web Runner Remote Control Spider". But here we are talking about "HGL remote control spider" which can be used to frighten people only at the ground level. 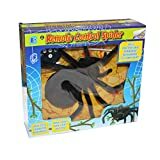 This is a spider toy with furry body and scary light up eyes and it can be moved in both forward and backward direction using the remote control. The remote control can also spin or rotate the spider in left or right direction as required. Just watch this toy in action in this youtube video where the movement of the spider is even scaring a dog. Some kind of face mask is also a great way to frighten someone. This face mask toy is best rated as its most scary than various other face masks. Damn.... just wear it and children will run from you unless they saw you wearing it. You will look like a demon from hell after wearing it. 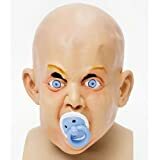 Dummy Halloween Chucky Fancy Dress is also provided along with this mask. So its a complete costume for any type of party. You could play the role of a demon after wearing it, for if you want to perform in a drama on a stage show.